The latest generation 18-in, 20-out USB audio interface can handle just about anything your band or studio can throw at it. Beautiful and rack mountable, it gives you loads of I/O, pristine sound quality, separate stereo headphone mixes, extensive expansion options and round-trip latency as low as 2.74ms, all in a 1U space. 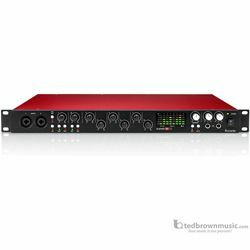 Focusrite interfaces are perfect partners for Pro Tools, so Scarlett 18i20 comes with Pro Tools First Focusrite Creative Pack, as well as Ableton Live Lite recording software and a suite of software and samples, so you can start recording straight away. Scarlett 18i20 works flawlessly with all major DAWs on Mac and PC.